It's Facebook Fridays! for September 16, 2016, and we are helping folks rid themselves of crossed conditions! The Lucky Mojo Curio Company is holding a random drawing to give away 7 great Uncrossing spiritual supply prizes that will liberate you from the dark work of others. 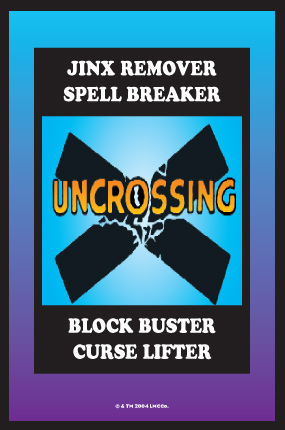 This week the grand prize winner will receive an Uncrossing Mojo Hand complete with a dram vial of Uncrossing Dressing Oil and full instructions for use. 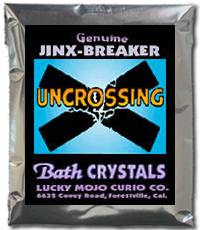 Six runners-up will each get a packet of hand-made Lucky Mojo brand Uncrossing Bath Crystals for cleansing, jinx-removal, and spiritual refreshment. First thing tomorrow morning, we will select SEVEN winners at random, announce their names here, and ask them to message this Facebook Page with their mailing addresses, so we can send them their FREE Uncrossing products. Thanks, Ernie, for posting this -- and folks, this is a great giveaway, so don't forget to click the link, which will take you to the LMCCo Facebook page, where you can enter your name and comments to win! We have a winner! In fact, we have 7 lucky winners! Our Facebook Fridays! winners for September 16, 2016 are: Rita Miller, Alison Rodgers, Sarah Goodearl Stevens, Bill Waddell, Jess DePew, Katherine SunFox Zimmerman Piehl, and Shaheen Miro.